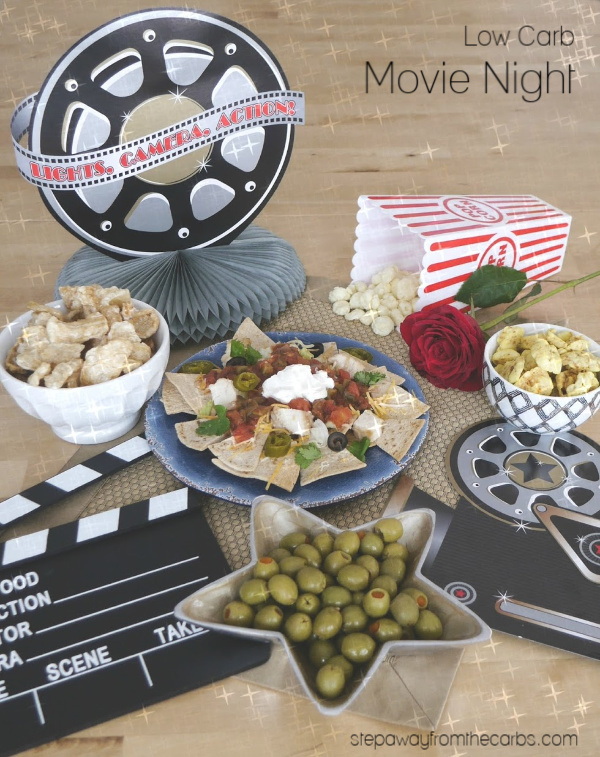 Fancy hosting a low carb Movie Night? Here’s a fantastic guide to snacks, appetizers, drinks, and more! Just for fun, I decided to put together a low carb movie night, so here you’ll find my top tips for making it a success. I’ve included food recipes and snack suggestions, drink options, decor ideas, and even some “low carb” movie ideas! The first thing that I think of when I consider a movie night is POPCORN. There’s about 5g net carbs in one cup of air popped popcorn – so it isn’t the worst food – but one cup isn’t very much! And that’s before you add anything like caramel coating or other flavorings. 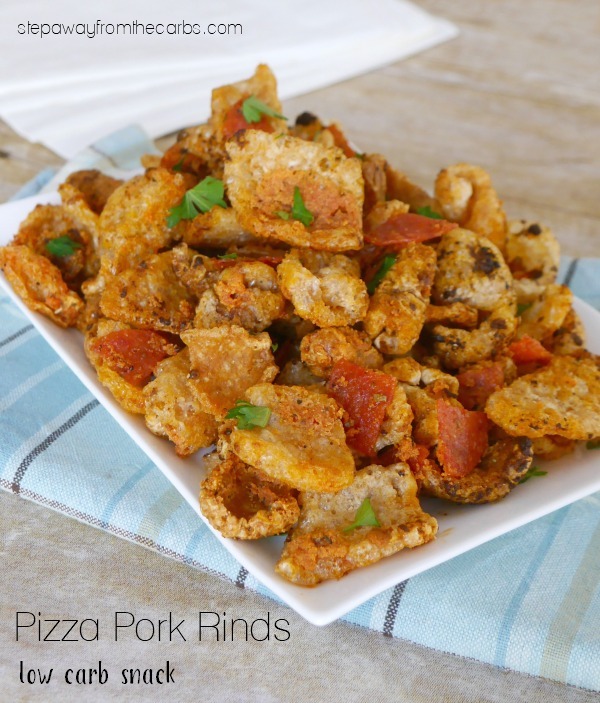 A while ago I made some pizza flavor pork rinds. They were absolutely delicious, and a wonderful snack to enjoy while watching a movie. And I think this is the key – don’t try and find something as similar to popcorn as possible (because there isn’t an exact substitution, let’s be honest) – but instead you should find a snack that you enjoy munching. Pepperoni Chips – they only take a minute or two in the microwave! 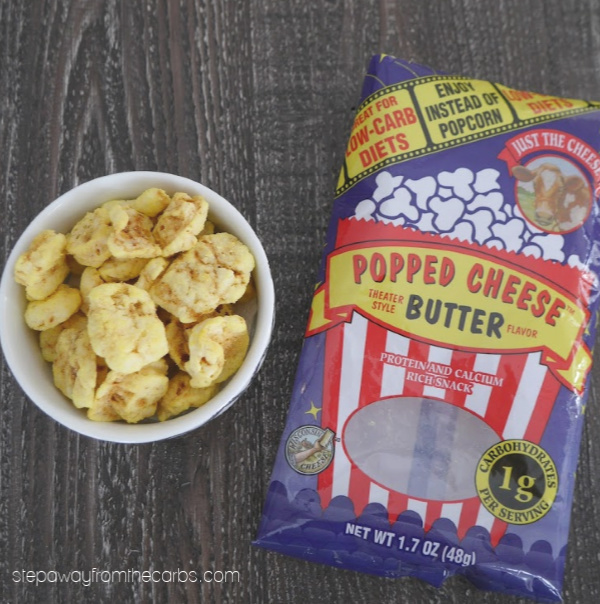 Butter Flavor Popped Cheese – Buy them from Netrition or the mini version from Amazon! Roasted nuts – you could try sautéing them in butter for that popcorn taste! Pecans and walnuts work especially well. 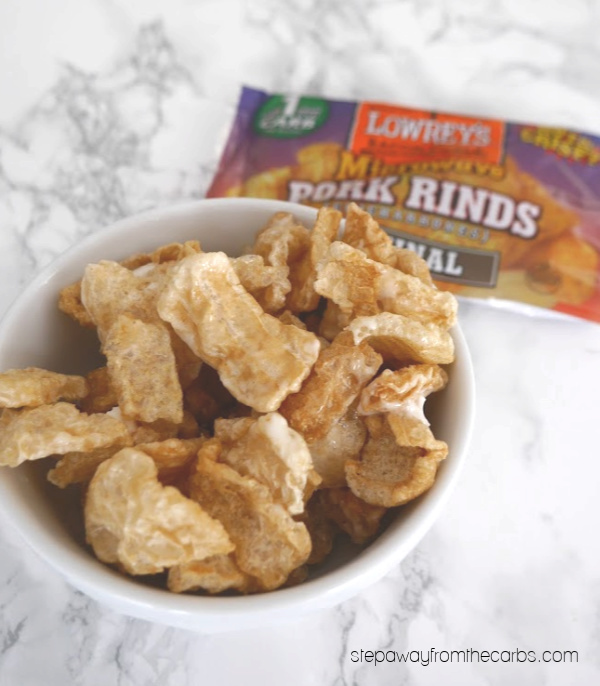 Buttery Pork Rinds – I tried a Microwave pack then tossed them in butter after cooking – delish! Seeds – I particularly like roasted pumpkin seeds! Update: I’ve just discovered Seaweed Thins – they’re completely addictive and easy to eat! I bought mine from Whole Foods but they’re also available from Amazon. 1g net carb per bag! But of course there’s more to a low carb movie night than popcorn! What about other low carb snacks? Pizzas are always popular – you just need a low carb crust. You can make your own dough from a mix, buy a low carb crust ready made (I like this one from Netrition) or make a cauliflower base. Or skip the dough altogether and make this wonderful pizza dip! Hot dogs are fun for a movie night, and a great alternative are those mini cocktail sausages – try my BBQ or Mustard version! 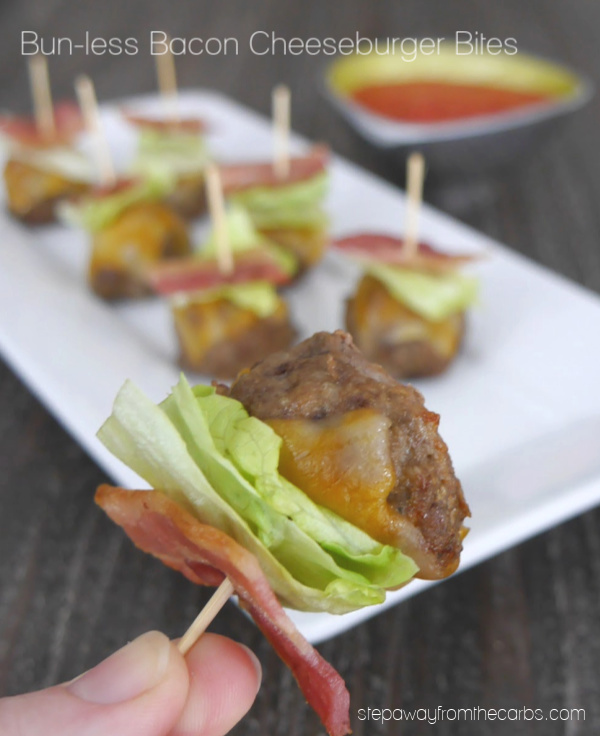 One or two-bite sliders are also great for snacking, so skip the carbs and try these Bun-less Bacon Cheeseburger Bites instead! I mentioned my Pizza Dip just now – but actually so many other dips would work well too! My favorite recipes are Buffalo Chicken, Crab Rangoon, and Butternut Squash with Parmesan. For the chips, you can provide raw veggies or make some easy homemade tortilla chips from low carb tortillas! 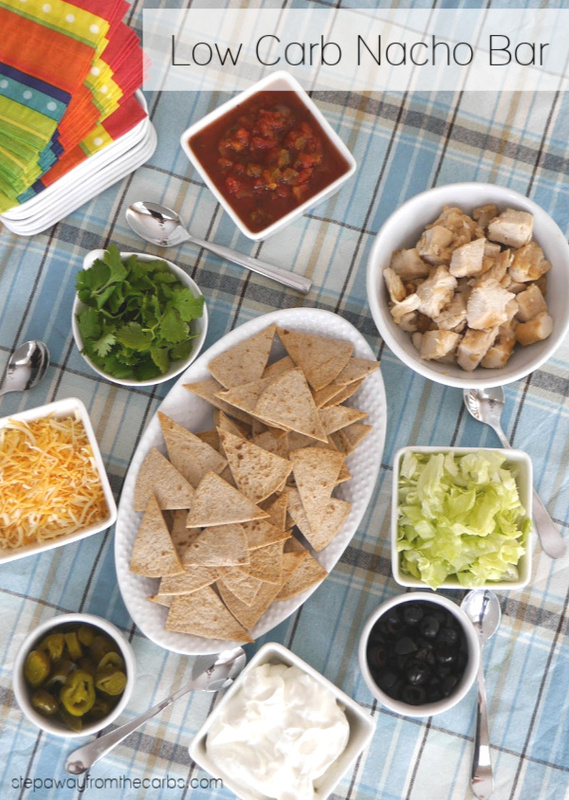 Oh – and talking of tortilla chips, why not provide a nacho bar?!? Make the chips as suggested above, then provide any combination of low carb toppings that you like! Check out my low carb nacho bar!!! And lastly, don’t forget chicken wings! 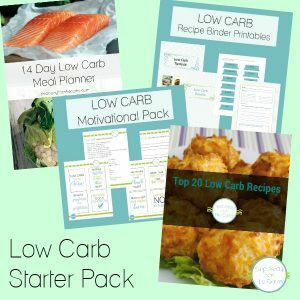 Here are 18 low carb recipes for you to try! So what about low carb drinks? If you’re a beer drinker, then there ARE some low carb beers you can try. There’s a really handy article on All Natural Ideas that you should read! 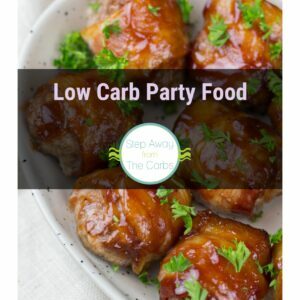 If you prefer cocktails, then I have some great suggestions in my post How To Host a Low Carb Cocktail Party – there’s some great ideas for nibbles there too! And if you like wine, I’d highly recommend you check out Dry Farm Wines – they extensively test thousands of types of wine and only sell those that are super low in carbs! And remember I mentioned some fun movie ideas? How about these? Do you like the movie decor that I used? You can find them on Amazon! I hope that you are now ready to host your first low carb movie night!!! !